Tobago offers everything you’d expect from a Caribbean paradise,. White sands, crystal clear waters and grand mountains make up the landscape of this tiny island, which sits just north of its sister country Trinidad. Tobago is no exception to the rule when it comes to the Caribbean’s laid-back reputation. Living is easy in this beautiful part of the world. You’ll find the locals to be both charming and welcoming in equal measures. Flights: You can fly to Tobago from various UK airports, including direct options from London Gatwick and Manchester. Passport/visa requirements: Your passport should be valid for a minimum period of 6 months from the date of entry into Trinidad and Tobago. Packing essentials: May to December sees a lot of rainfall, so prepare for that if you’re heading out during those months. January to April is peak season and boasts dry, warm climate, so sun protection and cool clothing is vital. Generally, the island sees warm weather all year round. The island has been relatively untouched by the tourist industry, making it a hidden gem and one of the Caribbean’s best-kept secrets. Venture into the forests and you will find some of the world’s most rare bird species. Elsewhere, you’ll discover an array of stunning beaches, historical monuments from the island’s early colonisation and cultural attractions, including the Kimme Museum – a must-see for all visitors to Tobago. 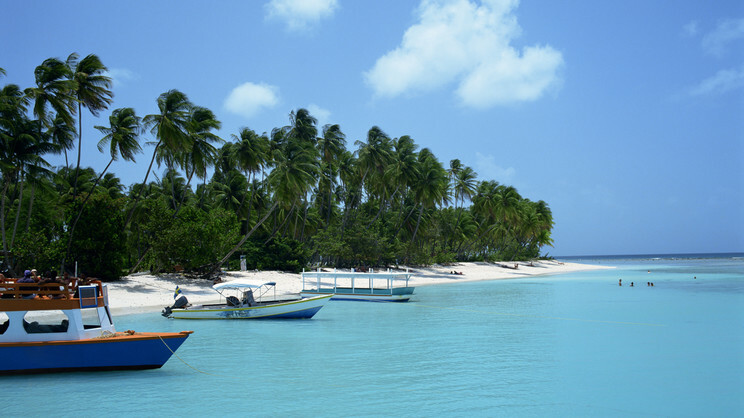 Tobago ticks all of the boxes meaning both family holidays and romantic getaways are possible. Whatever you enjoy doing on holiday, you’re likely to find it here, with water sports, marine parks and glass-bottom boat excursions to the famous Buccoo Reef. It’s activities galore on this splendid Caribbean island! Head towards the north of Tobago and you’ll find Speyside – an idyllic fishing village, where you’ll be able to book onto trips to the uninhabited islands of St Giles Island and Little Tobago. The latter is known as the ‘Bird of Paradise Island’ after Sir William Ingram imported 50 of the birds to the island in 1909. Tobago’s weather is quite similar to most other Caribbean islands, with temperatures mainly occupying the mid to high twenties. On particularly hot days, Tobago’s weather creeps into the thirties, although the breeze keep the climate manageable. Tobago’s high season falls between December and May, when the weather is dry. The island’s rainy season lasts from July to November. As Tobago lies just south of the Atlantic hurricane belt, extreme storms and hurricanes are rare. Tobago’s majestic beaches, wide-ranging wildlife, warm weather and captivating colonial heritage make it an ideal location for your dream holiday. The island of Trinidad is also just a stone's throw away, should you wish to do a little island hopping during your time here. One of the best beach experiences in the whole of the Caribbean has to be at Tobago’s Pigeon Point. After paying the minimal entry charge and making your way through the surrounding palm trees, you are sure to be left completely breathless by the captivating view. Old fishing huts have been transformed into restaurants and watering holes, while lifeguards keep an eye on you throughout the day which adds an extra level of safety to proceedings. If you a seeking a taste of paradise, Pigeon Point is the place to find it. Another great beach that is slightly off the beaten track is Englishman’s Bay. How long this remains the case is in question, though, as visitors to Tobago are picking up on this secluded gem, which offers gorgeous greenery and golden sands. If you’re looking to find Englishman’s Bay you need to be on the leeward coast of Tobago, between Castara and Parlatuvier. It may not be the busiest beach in Tobago, but it is arguably one of the most beautiful. A beach that is a little easier to find is Store Bay, in Crown Point. This golden stretch of sand is close to a number of hotels and even the airport. Here you’ll find plenty of water sports and boat trips, while you can even try some curried crab on one of the cleanest beaches in the country. Again, lifeguards are in action, so it’s great for families with children.